The way we work has changed for good. It's time business travel changed too. The world's best corporations and travel suppliers are onboard with Tripism. Find out why. We've rebuilt business travel from the ground up to bring you a smarter, faster way to plan and book your next trip. Want to use Tripism at work? We've got all the information you need to get started. Travel teams at many of the world's most innovative companies rely on Tripism. Find out just how simple integrating Tripism is. With Tripism's supplier portal, it's never been easier to reach the world's most valuable travelers. Discover why the world's most successful travel suppliers are onboard. We believe a company's success depends on how it travels. Drop us a note to discover the difference Tripism can make to your business. We are Tripism Limited registered in England with company number 08868704. We are a platform for business and frequent travellers, enabling Tripism members to share business travel recommendations, tips and plans with their trusted business network. Our registered office address is: 13 Kimberley Road, Cambridge, CB4 1HG, United Kingdom. Our operational office is: Eagle Labs, 28 Chesterton Road, Cambridge, CB4 3AZ, United Kingdom. You can contact us by email via [email protected]. Our Information Commissioner’s Office (ICO) registration reference is ZA354599. Our Privacy Officer is Adam Kerr who can be contacted directly via [email protected]. We collect and process your personal data when you use our site and services. This may be personal data you provide to us, that we collect about you and/or information we receive from other sources. information from clear gifs (also known as web beacons) which we may employ on our site and in HTML-based emails sent to our users to track the online usage patterns of our users anonymously and to track which emails are opened by recipients. 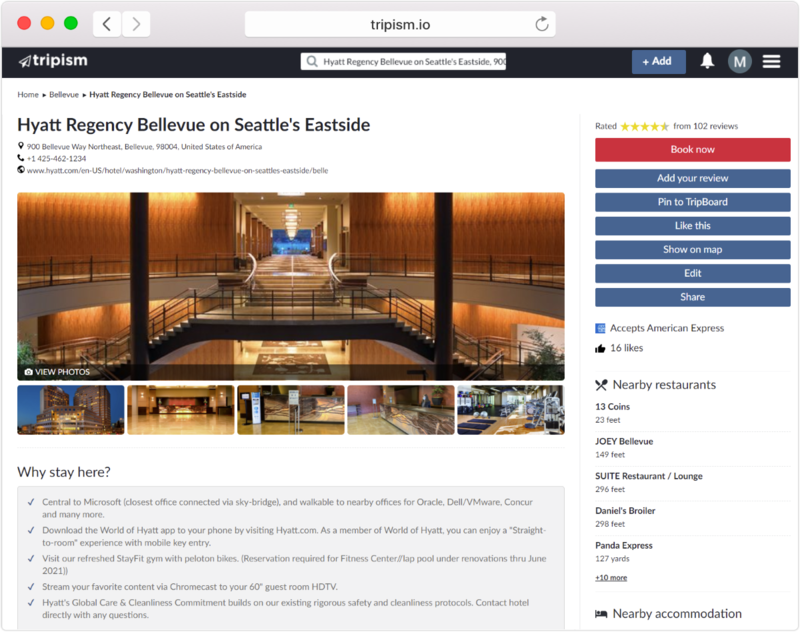 The information is used to enable more accurate reporting, improve the effectiveness of our marketing, and make Tripism better for our users. No personal data from your Tripism account is collected using these clear gifs. If you sign in to the services we provide through third party single-sign-on providers, you authorise those providers to provide Tripism with basic information such as your profile overview, name and email. You may also give Tripism access to other information about you and your contacts from these providers where available. Tripism will comply with the third parties' policies regarding data and respect your wishes regarding the same. For more information regarding the third parties’ policies please refer to their respective privacy polices. We use approved third parties to provide services to us (including, for example, business partners, sub-contractors in technical, payment and delivery services, advertising networks, analytics providers, search information providers, credit reference agencies) and may receive information about you from them. WHY DO WE COLLECT YOUR PERSONAL DATA AND WHAT IS OUR LEGAL BASIS FOR DOING SO? you have given your consent (consent). In the section below "How do we use your Personal Data?" we provide more detail on the legal basis relied on in each case. to provide you with news and updates in response to your request (consent). The data that we collect from you is stored within the European Economic Area ("EEA"), however it may be transferred to, and stored at, a destination outside the EEA. Such destinations may include countries where the level of protection provided for your personal data is not considered adequate by the European Union authorities. However, in such situations, we ensure that we put in place adequate safeguards to protect your personal data. Your personal data may also be processed by staff operating outside the EEA who work for us or for one of our suppliers. Such staff may be engaged in, among other things, the fulfilment of your order, the processing of your payment details and the provision of support services. If you wish to exercise your rights, please contact our Privacy Officer by email via [email protected] with "PRIVACY" in the subject of the email. If you have an issue or complaint arising under this policy then, in the first instance, please contact our Privacy Officer by email via [email protected] with "PRIVACY" in the subject of the email. The Services permit you to post or publish User Content, you may only post User Content that is original and that you have the right to post. By submitting User Content, you grant us a royalty-free, irrevocable, perpetual, non-exclusive, worldwide, fully sub-licensable, transferable, licence to publish, reproduce, distribute, display, perform, edit, adapt, modify, translate, create derivative works, make, sell, offer for sale, export, and otherwise use and exploit your User Content (or any portion thereof) in any way that we want and in any form, media, or technology now known or later developed. You hereby waive any moral rights you may have in your User Content. You represent that you have obtained all necessary permissions from any person identified in or implicated by your submission (including those shown in photographic content), and, in the case of minors, also from their parents or legal guardians, as appropriate. We are not obligated to publish or use your User Content. Tripism is not in any manner endorsing any User Content or Application Content that it may publish or post on the Services and cannot, and will not, vouch for its reliability. Tripism is not responsible for any User Content or Application Content and has no duty to monitor the User Content or Application Content posted on the Services. You use any information contained in User Content or Application Content at your own risk. Tripism and its designees have the right, in their sole discretion, to monitor, review, edit, remove, delete, disable, refuse, restrict, or terminate access to your User Content or the Services (in whole or in part) at any time, without prior notice and in our sole discretion, for any or no reason. The obligations that you have to us under these Terms shall survive termination of the Services, any use by you of the Services, any User Content on the Services, or these Terms. You will not continue to post any User Content that Tripism has previously advised you not to post. All content, information, materials, computer code, and software that are part of the Services other than your User Content (collectively, the "Application Content") is the property of Tripism or third parties. You may access, use and display the Services on a single computer or device and download and print copies of the Application Content only for non-commercial, informational, personal use, without modification or alteration in any way, and only so long as you comply with these Terms. Copyright and Other Intellectual Property Rights. The Application Content is protected under the copyright laws of the United Kingdom and other countries. You acknowledge that all copyrights and other intellectual property rights in the Services (including any improvement, modifications or enhancements to the same) are owned by Tripism or its third-party licensors to the full extent permitted under all international copyright laws and all other applicable laws. Unless expressly permitted by an authorized person in writing, you may not copy, reproduce, distribute, publish, enter into a database, display, perform, modify, create derivative works from, transmit, or in any way use or exploit any part of the Application Content except that you may make use of the content for educational and non-commercial purposes only, provided that you maintain all copyright and other notices posted along with the Application Content. To obtain written consent to use a copyrighted work, please contact us using the information in Section 18. Copying or downloading these materials for anything other than your personal use is a violation of these Terms. Trade and Service Marks. All rights in product names, the Tripism name, trade names, logos, service marks, trade dress, slogans, product packaging, and designs of Tripism products or services, whether or not appearing in large print or with the trade mark symbol, belong exclusively to Tripism or its licensors and are protected from reproduction, imitation, dilution, or confusing or misleading uses under national and international trade mark and copyright laws. The use or misuse of these trade marks or any materials, except as permitted herein, is expressly prohibited, and nothing stated or implied on the Services confers on you any licence or right under any patent or trade mark of Tripism, its affiliates, or any third party. To obtain written permission to use the trade and service mark rights of Tripism, please contact us using the information in Section 18. You may be asked to register for certain activities in connection with the Services. When you register, you agree to provide accurate, current and complete information about yourself as requested or directed on the Services and to promptly update this information to maintain its accuracy. Tripism has the right to suspend or terminate any account or other registration and to refuse any and all current or future use of the Services if it suspects that such information is inaccurate or incomplete. You are responsible for maintaining the confidentiality of any password and username that you are given or select in connection with the Services, and you are responsible for all activities that occur under your password or account. The Services may require an email address so that if you were to forget your username and password a text file with that data can be sent to you securely. In addition, any interactions or content you want to export from the Services can be exported and sent to your email address. Tripism may terminate these Terms for any reason at any time. Tripism reserves the right, in its sole discretion, to restrict, suspend, or terminate your access to and use of the Services, with or without prior notice. Otherwise applicable sections of the Terms shall survive termination. Tripism also reserves the right to seek all remedies available at law and in equity for violations of these Terms. Upon termination, you must cease all use of the Services, including any of the Application Content. Your use of the services is entirely at your own risk. We make no representations or warranties about the services, including without limitation the operation of the services or the information, materials, goods, or services appearing or offered on the services or with respect to any websites or services linked from the services. The services are provided "as is", "with all faults," and "as available" without limiting the generality of the foregoing, we disclaim all warranties, express, statutory or implied, including but not limited to (i) the warranties of merchantability, satisfactory purpose, fitness for a particular purpose, workmanlike effort, title, quiet enjoyment, no liens and no encumbrances; (ii) the warranties against infringement, misappropriation or violation of any intellectual property or proprietary rights of any person; (iii) warranties arising through course of dealing or usage in trade; and (iv) the warranties relating to the accuracy, reliability, correctness, or completeness of data or content made available on the Services or otherwise by Tripism. Further, there is no warranty that the services will meet your needs or requirements or the needs or requirements of any other person or the needs or requirements set forth in any documentation. We make no warranties, express, statutory or implied, that the services, including without limitation the application content, functions or materials contained therein, will be timely, secure, accurate, error-free, complete, up-to-date, free of viruses, or uninterrupted. Tripism does not necessarily endorse, support, sanction, encourage or agree with any application content or any user content, and we expressly disclaim any and all representations, warranties and liabilities in connection with any user content or application content. No oral or written information made available by or on behalf of Tripism shall create any warranty. Subject to this Section 11, under no circumstances, including without limitation negligence, will Tripism, its affiliates, or any party involved in creating, producing, or delivering the services be liable for damages or losses, whether in contract, tort (including negligence), breach of statutory duty, or otherwise, even if foreseeable, including without limitation direct, incidental, consequential, indirect, special, or punitive damages, loss of data, business interruption, loss of anticipated savings and direct or indirect lost profits arising out of the terms or your access, use, misuse, or inability to use the services, including without limitation any application content or user content, or any sites linked from the services, however caused, whether in contract, tort, negligence, strict liability or otherwise, even if Tripism has been advised of the possibility of such damages, or in connection with any failure of performance, error, omission, interruption, defect, delay in operation or transmission, computer virus, or line or system failure. Because some jurisdictions do not allow the exclusion or limitation of incidental or consequential damages, Tripism's liability in such jurisdictions shall be limited to the extent permitted by law. Subject to this Section 11, the maximum aggregate liability of Tripism arising out of or in any way connected to these Terms whether in contract, tort (including negligence) or otherwise, shall not exceed £50. The existence of one or more claims under these Terms will not increase Tripism's liability. You confirm that you own or otherwise control all of the rights to any User Content submitted by you; that all User Content submitted by you is accurate; and that exploitation of such User Content by Tripism and its other Users, partners, and licensees will not violate these Terms, cause injury to any person or entity, or infringe any third-party rights. These Terms constitute the entire agreement between Tripism and you with respect to the Services, superseding any prior or contemporaneous communications and proposals (whether oral, written or electronic) between you and us. In the event any provision of these Terms is held unenforceable, it will not affect the validity or enforceability of the remaining provisions and will be replaced by an enforceable provision that comes closest to the intention underlying the unenforceable provision. You must not assign these Terms or any rights or obligations herein without the prior written consent of Tripism and any attempted assignment in contravention of this provision is null and void and of no force or effect. Tripism has the right to assign these Terms, and any of its rights or obligations herein. These Terms are binding upon each party and its respective successors, heirs, trustees, administrators, executors and permitted assigns. These Terms are made under and shall be governed by and construed in accordance with the laws of England without regard to its conflicts of law provisions. Any claim or controversy (including any non-contractual disputes or claims) arising out of or related to these Terms shall be instituted exclusively in the English courts. Your relationship to Tripism is that of an independent contractor, and neither party is an agent or partner of the other. No one other than a party to these Terms or their successors and permitted assignees shall have any right to enforce any of its terms. Some functionalities of the Application may require the transmission of information provided by you, including names and passwords, addresses, e-mail addresses, e-mails (including history and voice memos), financial information, location based information, textual notes and annotations. By using these functionalities, you are consenting to the transmission of this information to us and/or our agents to collect, use and share such information as necessary for the Application functionality and for the purposes described in our Privacy Notice. Please direct any questions, complaints or claims related to the Services or your use of the Services to [email protected]. You can find more information about cookies, including how to see what cookies have been set on your device and how to manage and delete them at www.aboutcookies.org or www.allaboutcookies.org. In order to set your browser to reject cookies, refer to the help instructions supplied by the browser provider (usually located within the "Help", "Tools" or "Edit" menu). More detailed guidance can be found at www.aboutcookies.org or www.allaboutcookies.org. If you have any queries in relation to this notice, please contact us at [email protected].